Investing in the health and wellbeing of employees has proven to increase moral and engagement, create a healthier and more inclusive culture and a lower sickness and absence rate. Table tennis is a cost effective and easy to implement workplace activity that has seen regular players report significantly higher job satisfaction, greater competence in the workplace and connectedness with their colleagues, along with numerous other mental and physical health benefits. Table Tennis England have developed Loop at Work, a package designed to directly meet the health and wellbeing needs of workplaces. 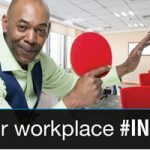 It provides organisations everything they need to plan and implement ping pong within the work environment. The package includes a table, support from Table Tennis England and an activation pack (containing bats, balls, posters, trophies and a rules and ideas booklet) with prices that start at £200 (50% off the RRP price). For more information or to find out how to get involved, please visit www.loopatwork.co.uk email loop@tabletennisengland.co.uk or telephone 01908 208887.